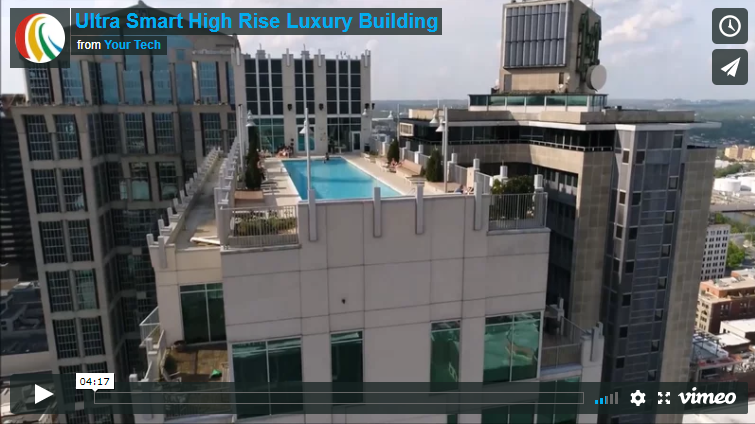 An existing client recently asked how we would design the world’s smartest luxury high-rise. We applied the same innovative spirit that allowed us to win the Electronic House 2017 Home of the Year award and assembled our vision for the luxury building. Join us as we examine a small fraction of the unlimited possibilities. Imagine returning to your home in the sky after a long day of work… As you approach the parking garage, the gate opens – all without the press of a single button. While you wait for the elevator to arrive, a warm voice greets you by name, welcoming you home. When the doors open, you are whisked directly to your private foyer – again, all without the press of a single button. So how is a truly hands-free system possible? We use a simple access control system – the same as keyless entry in a modern car. The real magic happens with our Apple-powered Savant automation system, which unlocks truly unlimited potential. For primary building control, a commercial Savant system will be used. This system will produce voice greetings; manage lighting, climate and security; and facilitate media functions within the common areas. Each unit would have its own, individual Savant system pre-installed. This system would provide basic visitor notifications and building alerts, as well as music control for the unit. Each unit will have comprehensive pre-wiring for entertainment, lighting, climate, security and shades to fit any taste and lifestyle. Owners merely need to contact any Savant dealer. So what about visitors? We have that covered, too. Building tenants like their privacy. We’ve designed a system that would allow tenants free flow of visitors while maintaining top security for their neighbors. These visitor intercoms would be present at every entrance and elevator for convenient private visitor management. Homeowners can use an app to issue visitor pin codes that expire. Visitors can enter a valid pin or apartment number at any intercom. The building would warmly greet your visitor by name and issue automated instructions. First impressions are always crucial, as they color every perception thereafter to a potential buyer or visitor. In that vein, we present an array of technology guaranteed to generate that ideal first impression. If you’re building the next ultra smart high-rise, consider these are just a few of the ideas we have. You’ll want us to be part of the team working on your vision!